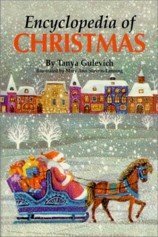 A readable, well documented and illustrated book on the traditions of christmas, not just in Scandinavia but around the world. Christmas is a holiday with rich traditions. The long history has produced numerous books and documents, yet there has been no single source in which to look up facts about the many facets of this holiday. Now this book provides you with a convenient source of information on virtually every aspect of the holidays. It contains nearly 200 entries on all facets of Christmas, including its history, myths, legends, customs, religious observances, symbols, and related days and celebrations. Entries range in length from about 100-200 words to longer essays of 2,000 words and more. Each entry includes a list of books for further reading, and many entries list web sites that contain information on the topic. Throughout the book, numerous cross references guide the user to the appropriate entry. This encyclopedia emphasizes ancient customs and the traditional aspects of Christmas. These are thoroughly covered in 186 entries which include holiday symbols, legends, and mythical spirits that bring gifts. A number of entries focus on archaic customs and superstitions no longer in practice. These played roles in shaping the modern Christmas, however, and therefore are of historical interest. Also discussed are the customs and cuisine of selected, individual countries around the world. An extensive index and bibliography are helpful, and several appendices list Christmas web sites and "Christmas Associations" (organizations). 50 full-page black-and-white line drawings of contemporary style.